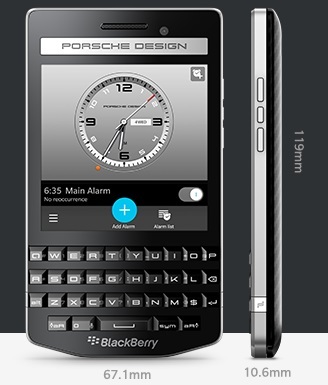 Blackberry has recently unveiled one of its highly priced Porsche Design Line up P’9983. Though the images were leaked on the internet a month ago, it has been officially announced recently. The earlier smartphones from the Porsche series were P’9981 and P’9982. This was a result of the collaboration with Porsche designed luxury brand. It comes with a glass-like QWERTY keyboard and it has a glass-weaved designed along with the finish of stainless steel. The Canadian company promises the best mobile typing experience in this new keyboard with a 3D effect in its keys along with silver fonts inscribed on it. In this model, you will have the privilege of switching the back panels with those made of Italian leather. Yellow, brown, blue green, blue, orange, salsa and Paloma grey are the different colour options provided. Coming to the specifications, this smartphone sports a display of 720 X 720 pixels and a screen size of 3.1 inch. It is built with 1.5 GHz dual-core Qualcomm processor along with 2 GB of RAM. It has an internal storage of 64 GB and also comes with a microSD support of up to 128 GB and a battery of 2100 mAh. The phone will run on the Blackberry OS 10.3. Adding to its rich features is a sapphire glass for the camera lens. It is expected to hit the stores in the early days of October. Though the price of the product has not been announced yet, we can very well estimate by having a look at its features that the pricing will be very high.